I discovered your site from the Essence article. I love, love, love it! Exactly what I have been looking for. Since then I have been feverishly trying to read all the material. Thank you so much. Congratulations chica, well deserved, I am with you nothing like holding the mag and seeing your self in it. Brings a little tear. Big things in 2011. Congrats times a thousand! I’m thrilled more and more people see and know about the great work you’re doing. 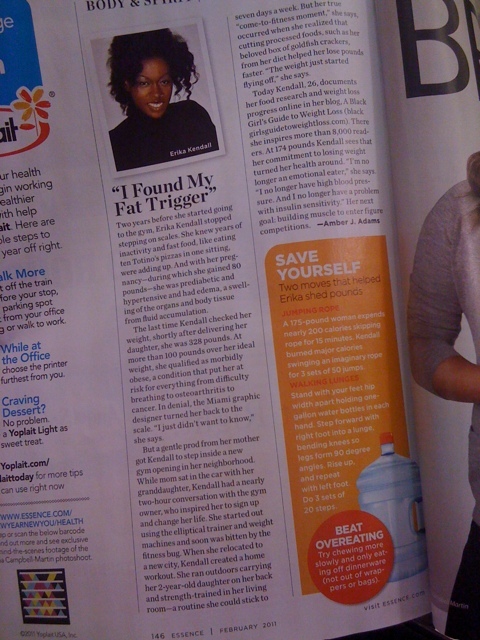 And I’m especially happy to see a sistah who’s getting props for talking about heathy living. You keeping rockin’, Erika! Good for you! Keep doing what you’re doing. Congrats! I actually thought one day, it would be so much easier to lose weight if there was a black girls diet! lol so after googling my idea ur website popped up and i was like wutttt!!!! a black girls guide to weightloss! thats exactly wut i was lookin for! then to my surprise when i picked up my essence yesterday i saw ur article! Keep takin ova mama ur fab!! 7lbs down!! Oh my goodness! You go girl!!! I am so proud of you… really I am! I have that mag and I haven’t devoured it yet… well… now I have a reason!! !